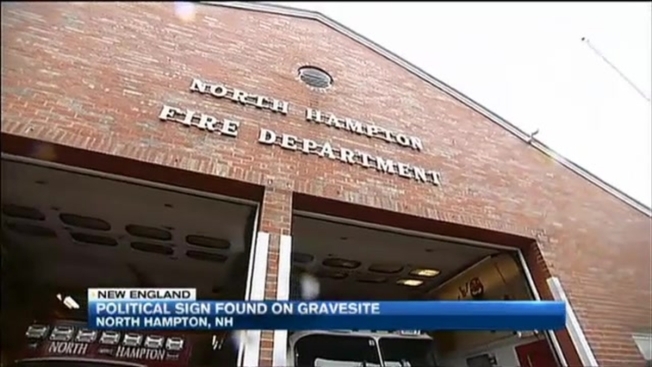 Police in North Hampton, New Hampshire, are investigating after a town firefighter found a political sign on top of his daughter's grave site. It's been 15 years since Amanda Francis's father, Lt. Peter Francis, has been able to give her a hug, but at the very least he has a special spot to visit. "Lt. Francis goes to the cemetery just about everyday to see his daughter," said North Hampton Fire Chief Michael Tully. When Francis came to Post Road Cemetery to visit his daughter last Friday, he found a sign stuck in the snow almost right on top of her grave. That sign urged voters to stand against the construction of a new fire and police complex. "Stop the complex again! Vote no on 6 & 7," the sign said. "For him and his family, they dealt with this loss years ago, and I think it just dredged it up all over again," Chief Tully said Thursday. Tully believes a town resident specifically targeted Lt. Francis, a well-respected, 28-year veteran of the department. "That's what makes it difficult, because he's the typical model employee in the community taking care of your family," Tully said. "He's the type of person who comes into work everyday ready to work, does his job, does his best, and goes home." When necn showed the photo of the political sign on the grave to residents nearby, reactions were all the same. "I think that is very disrespectful," said Hampton resident Lucy Boulter. "It's horrible, despicable," said Elliot Lundquist who was just in town for lunch. Former selectman Don Gould was appalled, saying, "As far as I am concerned, it's an act of pure evil." The sign is now being analyzed at the state forensic lab while North Hampton Police follow leads to figure out who did this and why. The new safety complex was voted down Tuesday night. But the fire chief says right now, that's the least of his concerns. "We're a community and we may disagree on things within the community, but when it becomes personal, I don't think that's a positive reflection on what North Hampton is and the people that live here," Tully said. "We're all supposed to be neighbors, and this kind of thing makes me sick to my stomach," Gould said. Since the report, police have been patrolling the cemetery. They're hoping the community will come together to help them solve this crime. People can call the PD at (603) 964-2198 or send an anonymous tip by going to www.tipsubmit.com and clicking on "Hamptons" as the region.